Note: This post is for educational purposes only. 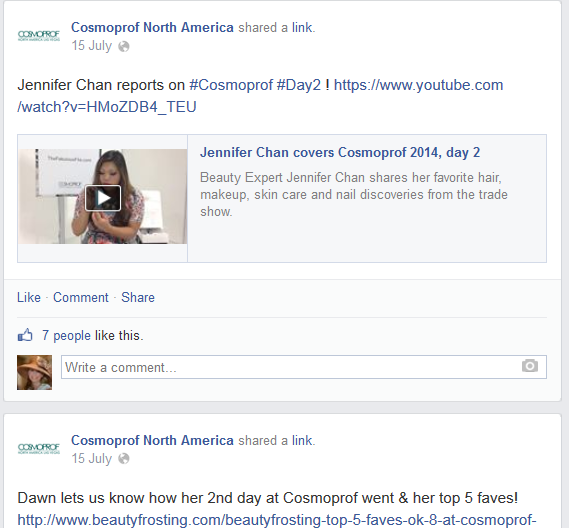 I am not affiliated with Cosmoprof or their marketing efforts in any way. 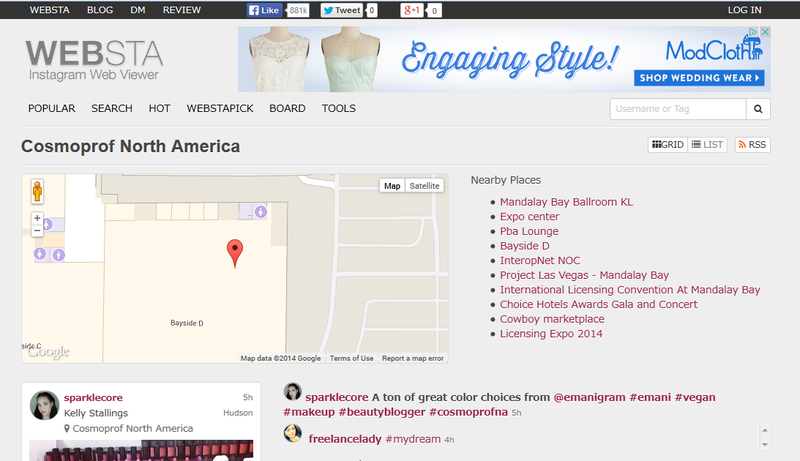 Being a trade show, this is clearly a B2B event, and their marketing efforts are targeting beauty business professionals, not retail customers, so I’m going to be taking a look at their event marketing for their most recent show that took place July 13-15, 2014 in Las Vegas, NV. 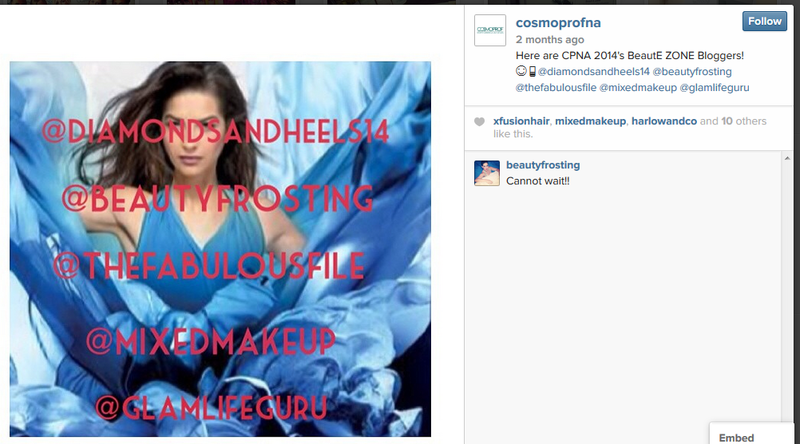 Cosmopro had links to their Facebook, Twitter, LinkedIn, Pinterest, and Instagram channels from their webpage. In addition, they used their webpage, blog, and had some YouTube content, as well. From a branding perspective, Cosmoprof used similar colors and photos throughout their social media channels and had a consistent logo. I would’ve liked to see their Twitter and Instagram accounts have the same name. 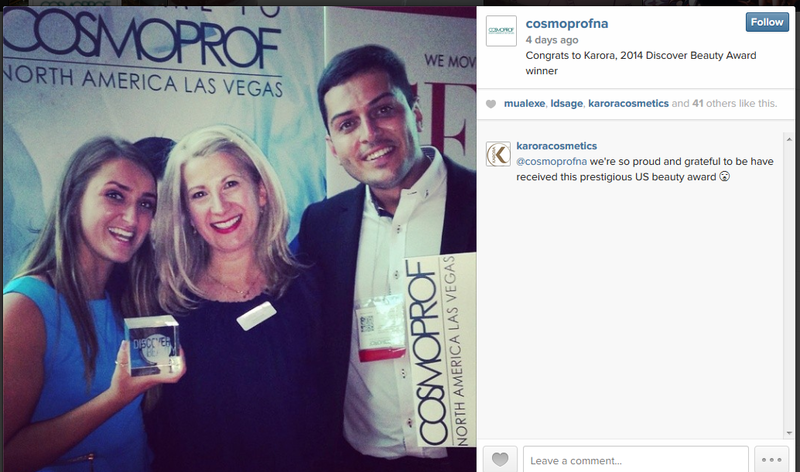 As it were, they were @cosmoproflv and @cosmoprofna, respectively. Leading up the show, much of their posts focused on Twitter and Facebook. A lot of the content on Twitter consisted of retweeting others’ excitement about the upcoming show. They seemed to be advertising sponsors and also cross-promoting other channels, too. I appreciated that their Facebook channel linked back to the website. I also liked the idea behind the Twitter status update pictured below. I wish the above tweet had contained an actual link to the Instagram account, especially since the link from the Cosmoprof website didn’t link directly to their Instagram account. Rather, it linked to an aggregating service which seemed to post others’ Instagram photos when they checked in at the event. This was a big miss, in my opinion. While it was nice to see all the content from those who had checked in at the event, a better way to see the content would have been to advertise a specific event hashtag and encourage users to tweet and post using it. 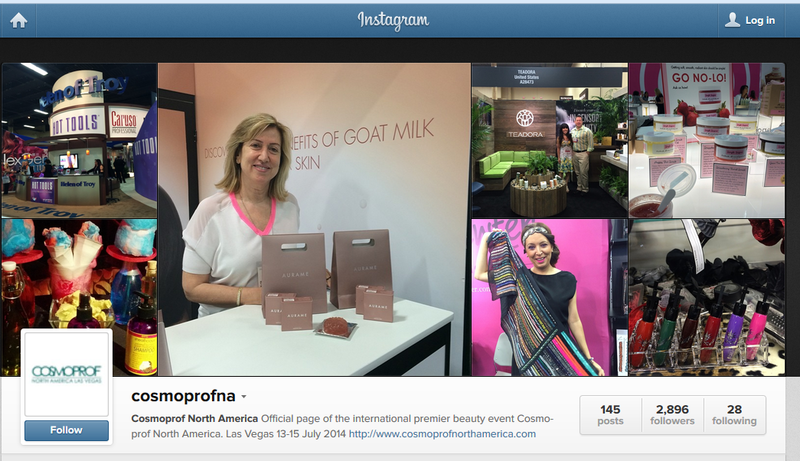 As is were, the event didn’t seem to have an official hashtag, and several incarnations were used: #cosmoprofna, #cpna2014, #cosmoprof2014, #cpna. While users often invent their own hashtags for events they attend (I’ve done it), if an official hashtag is promoted and then consistently used by the brand, this can allow for users to embrace the use of it themselves, therefore furthering the event brand. Their best tool before the event was clearly their website. This was the clear highlight for me when looking at their online marketing. There was good information about the event, such as registration, media links, exhibitor information, and much more. Their website was, by far, their best promotional tool, and, as a result, I think they should have been linking back to it in many more of their posts. As it was, they only linked back to their website occasionally. One simple way to do this would be to link a map of the floor plan to their tweets advertising certain booths. An even better way would’ve been to have a current app that had the schedule, floor plan, and other details available at the attendees’ fingertips. Cosmoprof did have an app available on their website, but it was not current and was from the year before. Perhaps there wasn’t much interest the year before, but they should have updated it nonetheless, since we are certainly moving in a more mobile smartphone direction as a society, and that’s only going to continue to increase. 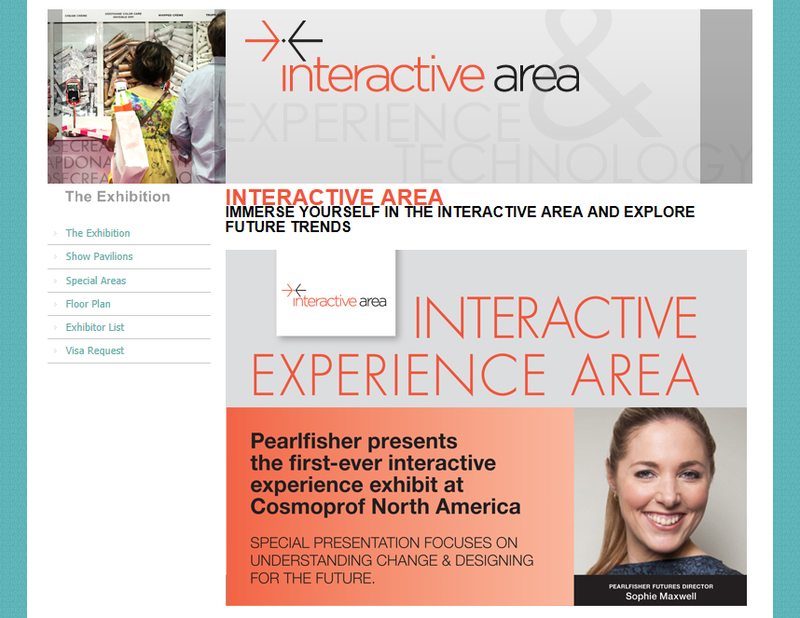 Cosmoprof did a good job advertising their Interactive Experience Area on their website, as well. I’d like to see them do more cross-promotional social marketing on other channels. I’d also like to see more content from this area showcased on their social media channels. One of the best examples of integrated marketing took place on their website, where they had information about print buzz, press releases, marketing opportunities, and a newsletter to sign up for. Interestingly, there were no updates from the newsletter throughout the event. There was not even a confirmation email sent when you signed up for it. Another miss. I liked how they promoted their blog partners prior to the event in the above Instagram post. Cosmoprof got a lot of their content from users. This was especially true on Instagram and especially Twitter, where they retweeted a lot of sponsor and user content. During the event, from July 12-July 15, their Facebook likes increased from 5,059-5,113, and as of today they’re at 5,138. Twitter followers increased from 2,646-2,709; now they’re at 2,725. Their LinkedIn group went from 2,406-2,418. Instagram showed the biggest increase with their followers going from 1,897-2,743 during the event and now, a few days later, it’s at 2,896! This is amazing, given that they only posted only 36 time on Instagram. Obviously, this is a social media channel where they should’ve dedicated more resources and should certainly do so for future events. Their Pinterest page went from 270 followers to only 273 during the days of the show and is now at 275. I was most disappointed with their Pinterest page, since this is an industry that really does quite well on Pinterest, with how visual it is and how many beauty tips that could have been given. This could also be a great place to showcase sponsors. The blog posts shown on Pinterest were also from last year. This channel did not seem to be very current, and it made me wonder why they chose to link to it from their website, when it was so sparse. LinkedIn was a closed group that should have been an event page or open group. It was puzzling to me that this would also be one of the channels linked from their website. That brings me to their YouTube channel, which was not linked to from their website and for good reason. It contained two videos, one of which was labeled as 2014 highlights, but was really posted before the event, and should’ve been titled better. Twitter was by far the most active channel during the event; they tweeted over 280 times! While they did a lot of retweeting, they also showcased certain booths, which was a good choice. Much of their content seemed spur of the moment, and I would’ve liked to have seen some more planned posting during the event — on all of the social networks. After the event, there was little to no official activity. The banner on the website changed to a new countdown to next year’s event. This was another great use of their website. The only official content that I saw on social media after the event was announcing the Discover Beauty Award Winner. With the website already gearing up for next year’s show, this would be a great time to continue building momentum from this year’s event into excitement for next year’s. All in all, the social media efforts were fine. They were not great. 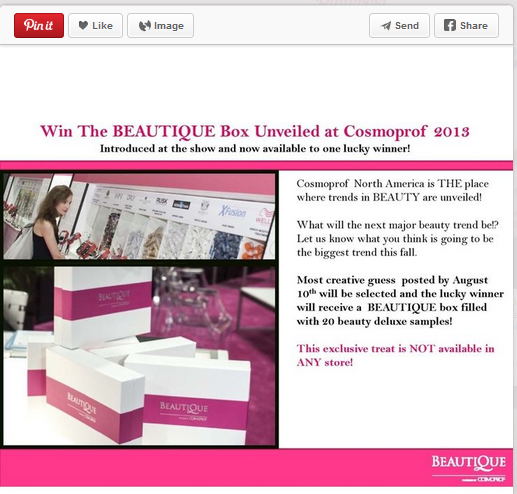 Cosmoprof clearly sees the relevancy of social media at their event and is incorporating it into their marketing efforts. They still have a long way to go, but they are on the right path.